The regal high neck blouse designs are hot in trend and look amazing on long lean women. High necks are best if you are aiming for an elegant look without compromising on comfort because who wants to keep getting conscious when bending in those deep neck blouses? When you say high neck, collar neck blouse designs come to mind but most women actually stay away from blouse designs with a collar detailing because it gives them a very stuffy feeling but if you choose the right design they can actually look very classy and be worn all year round. 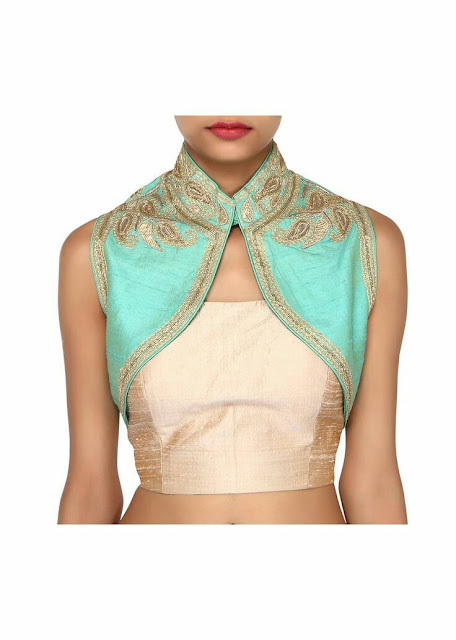 Collar neck blouse designs are most suited for formal, semi formal and traditional occasions but ofcourse when these blouses are styled in more glam way they can be worn even to parties and festive occasions. There are many variations even in the collar neck blouse designs and today I will be discussing these designs in my post so you choose the ones which suit your style the best..
High neck blouses when paired with sheer net or lace sarees give a very elegant regal vibe. 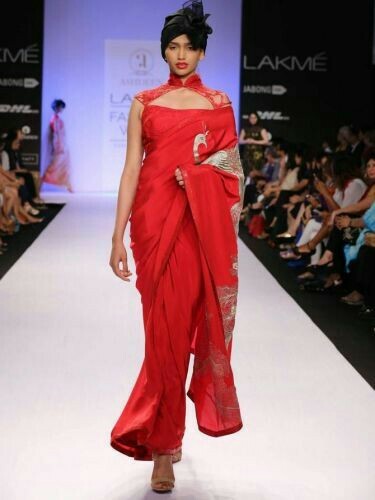 Opt for a standing collar neck blouse with your saree for a stylish party look . 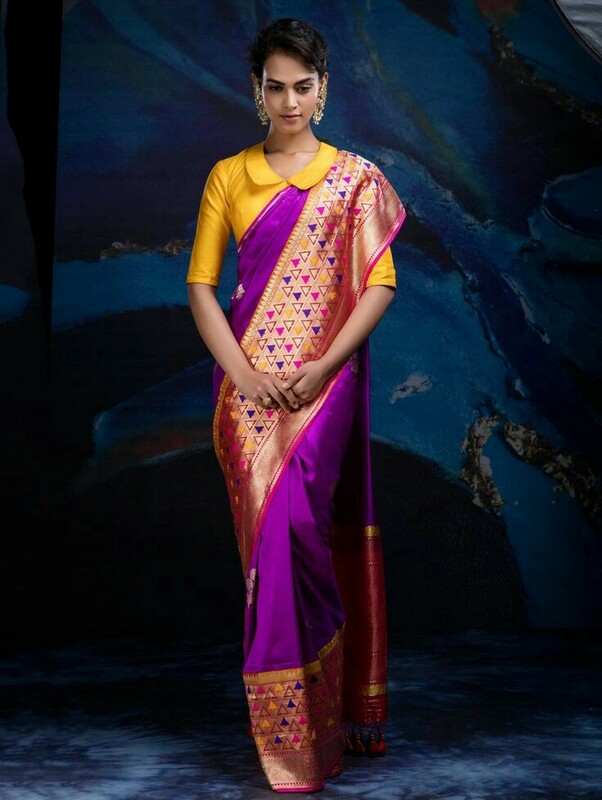 You can wear standing collar neck blouse design even to office with a cotton saree. Since this blouse design has a colsed collar neck go sleeveles or half sleeves and avoid full sleeves to balance out the look. If you want to wear a trendy and fun collar neck blouse design go for a flap collar pattern with elbow length sleeves and avoid neck jewellery for added impact. Like I mentioned before shirt pattern collar neck blouses can be worn outside your office too. Go for sleeveless patterns for more casual look. 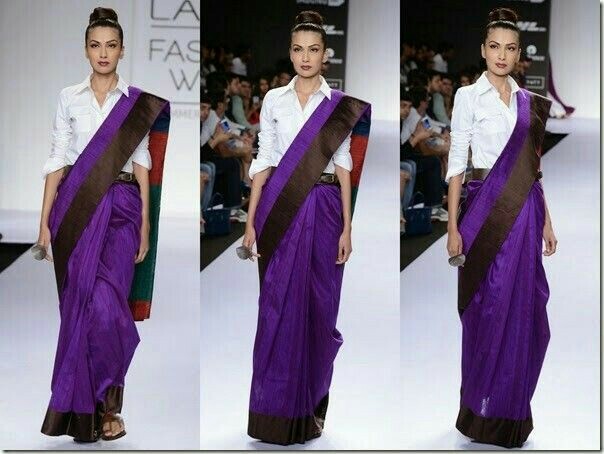 Sleeveless shirt collar neck design actally looks good when paired with subtle coloured saris even for work . You can even go for a jacket style collar neck blouse for a chic look . 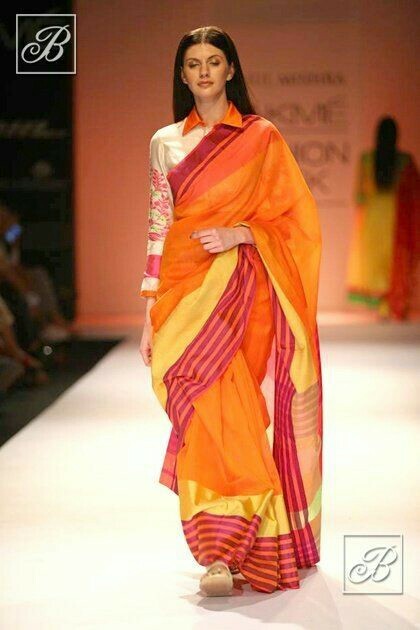 You can get a short jacket stitched and wear it over your normal blouse for this kind of a saree look. For a winter jacket collar look go for a full sleeved jacket over a simple blouse. Go for a longer jacket for a more trendy and regal winter wedding look. 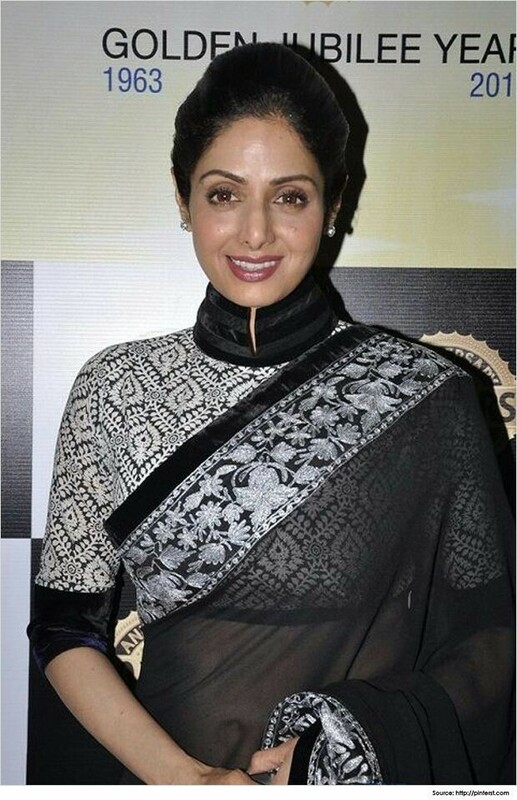 This winter forget the necklace and wear a turle neck style collar blouse design like sridevi wears to beat the cold in style. 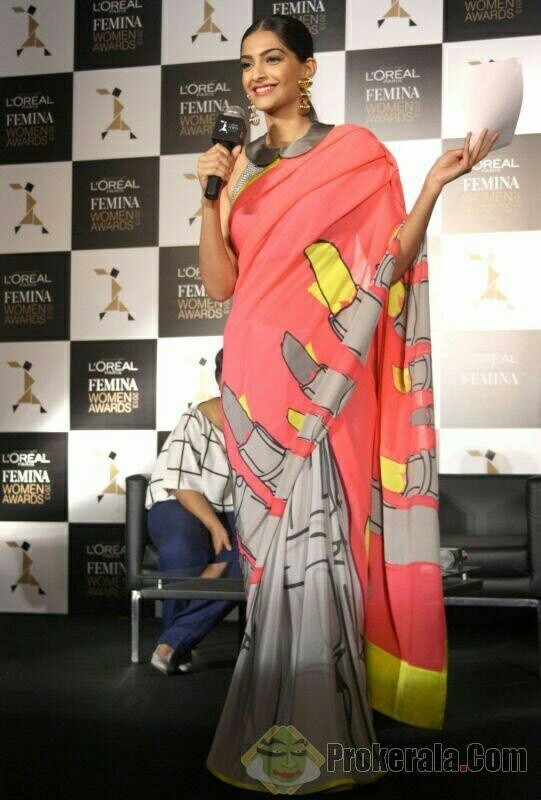 Who needs a shawl when you have a blouse so trendy? If you are in the mood to try something edgy or funky go for a peter pan ollar neck blouse design. Go for simple styling with a high bun or braid and simple studs to keep your blouse the highlight of the look. 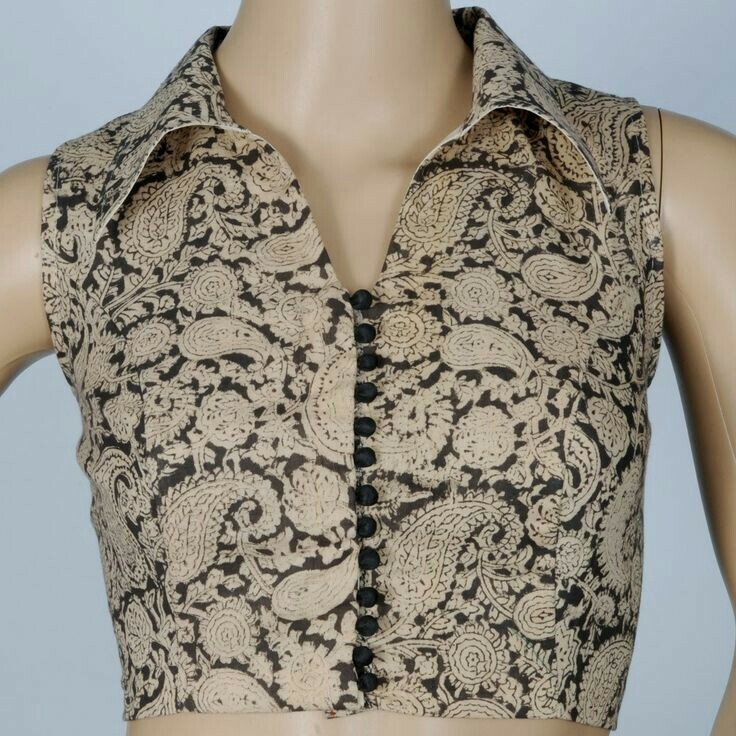 This blouse design is sure to help you stand out in a party so be prepared for all the attention. 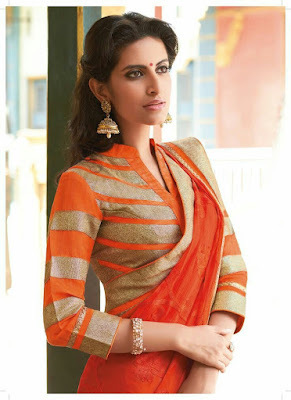 You can wear collar neck blouses even for parties and festive occasions if you go for semi sheer necklines. 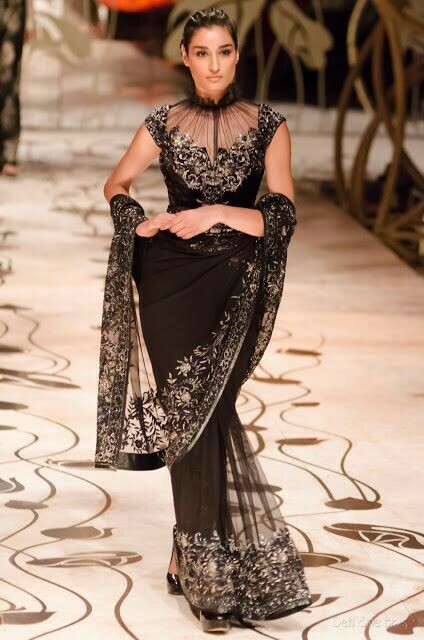 semi sheer necklines with lace or net give a very girly touch to your look without showing much skin. Zipper on saree blouses are a thing these days and you can make your collar neck blouses edgy by adding a front open zip detailing to it . With collar neck blouses also you can play with your back. Go for huge cut outs or elegant key hole paterns in the back to make your collar neck blouse design trendy and comfortable. 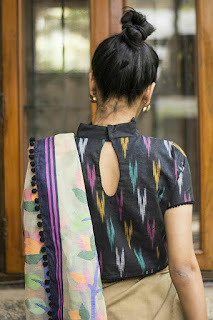 So are you ready to wear collar neck blouses in all seasons?